The first thing to appreciate is a type of image codec known as a PSD file. PSD is an acronym for Photoshop Document and it is one of the most commonly used variants when rendering a graphical image. However, there are several benefits associated with this format. PSD files are capable of being effectively "split" into different layers. This signifies that the user can modify specific portions of an image without changing the appearance of the image as a whole. Let's take a look at an example. Imagine for a moment that you have chosen to place a three-dimensional design on a t-shirt. While the background might be fine, you could want to adjust the hue or the tone of the foreground content. With a PSD file, you will not be forced to modify the content as a whole. You can select a specific layer (the background in this instance) and it can be changed before being saved. In the event that you make a mistake, you can always edit the history and choose the "undo" option. In other words, PSD files are great at providing you with a superior sense of flexibility that is not always possible when working with standard formats such as JPG or JPEG. The key takeaway point here is that it can be a bit tricky to work with layers if you are unaware of the functionalities associated with Photoshop. It is still worth taking the time to learn the basics before designing a t-short from scratch. You will thereafter be able to improve as you go along. There are a host of Adobe tutorials available and it is always worthwhile looking for video guidance on major sites such as YouTube; a wealth of information will be made available with the click of a button. 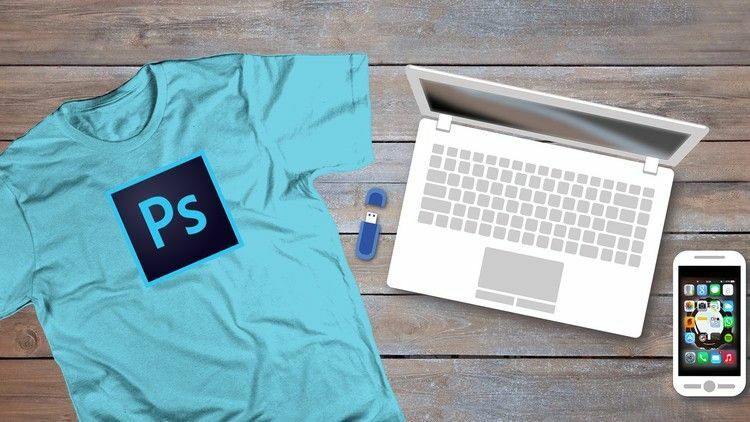 Although PSD files are great ways to design a stunning t-shirt image, these are far from the only tools at your disposal. One increasingly common option is to use what is known as a t-shirt "mock-up". Mock-ups will essentially place your image upon a virtual shirt so that the customer knows what to expect if he or she decides to make a purchase. In fact, there are even times when a digital model can be used so that the shirt and its associated content is displayed within a realistic environment. Both of these methods are meant to add an additional layer of physicality to what it is that you have to offer. Let's also not forget to mention the critical role of e-commerce platforms. Of what use is a catchy and trending t-shirt design if it will never reach its intended audience? This is akin to creating a stunning website and subsequently failing to promote its content. Modern e-commerce solutions will provide you with the online clout that is needed to reach your target audience; no matter how large or how small this demographic may be. The key point is that exposure drives sales and publicity. Those who like the products that you have to offer are likely to speak with their friends. This type of publicity is invaluable within the modern digital world. On a final note, never forget the importance of cross-channel marketing. Do not limit yourself to a single website or portal. You should instead your t-shirts and any other associated items across a wide range of venues. These include blog posts, Instagram, Twitter, Facebook and any other worthwhile portals that you may be aware of. T-shirt sales are some of the most effective ways to turn a sizeable profit and you will be able to take your skills to the next level if you follow the professional advice mentioned throughout this article.